Working with worms, a graduate student set out to understand what memories are at their most basic level. Getting the data turned out to be the easy part. Xin Jin had been staring blankly at her computer screen for a good 10 minutes when the question, spoken from above her shoulder, made her rattle in her seat. Mildly troubled by the data she was analyzing, she hadn’t noticed the approach of her advisor, neuroscientist Cori Bargmann, who appeared to have materialized behind her, wizard-like, to assist in her rumination. It was early 2013, and Jin was halfway through her graduate thesis project, trying to understand how C. elegans, a flea-size worm that lives in the soil, uses its tiny brain to learn and remember things. On this particular day, she was looking at the first results from months of experiments designed to determine how a specific neural circuit in the worm generates a memory and then later recovers it. But as eager as Jin was to get these results, she couldn’t quite make sense of them. It would take Jin and Bargmann at least two more years to fully understand these weird but interesting findings, which seemed to suggest that the cells that are critical for shaping a worm’s memory have no stake in reviving it later. Because what Jin didn’t know on that day four years ago—but eventually found out and reported last year as the first author of an extensive paper in the journal Cell—is that even in C. elegans, whose brain contains only 302 neurons, the formation and retrieval of a memory are separate processes, performed by distinct neural circuits residing in different parts of the brain. This and other discoveries she made during her thesis work suggest that—at least in the context of learning—the humble worm is remarkably sophisticated, and more similar to us than researchers had previously imagined. And ultimately, her findings will help scientists dig deeper into the cognitive processes that all animals’ brains are capable of. “Honestly, biology is often messy and confusing to me,” says Jin, gleefully. Today, she is a freshly graduated Ph.D. and a junior fellow at Harvard. Of the many things she learned while training at Rockefeller, she says one of the most important is to be open-minded—to never get too attached to an idea or insist on proving a particular hypothesis. The worm has something unique to offer scientists like Jin and Bargmann, who want to understand the very basics of the brain and how it generates behavior. It’s a neurological microcosm in which each nerve cell has been painstakingly mapped out, and can be genetically manipulated or induced to fluoresce under the microscope. “We need a very simple system to ask very basic questions,” Jin says. “What exactly is a memory? What changes in the brain when we make one?” During her graduate work, she was able to pinpoint the cells and genes required for a process called imprinting, which allows young worms to form lifelong memories in response to certain traumatic experiences. In nature, C. elegans feeds on bacteria, and relies on its sense of smell to decide which species of microbe to eat and which to avoid. In the lab, Jin set up experiments in which she placed worm eggs to hatch on a lawn of poisonous bacteria, which made the baby worms sick. After half a day, she switched the young worms over to plates stocked with more gourmet bacteria. And three days after that, she reexposed the animals—now adults—to choose between the toxic diet and the good one, and examined their decision-making. It turns out that worms that have had this unpleasant experience early in life will remember it for good. When they smell the same strain of bacteria as grown-ups, they flee, and this behavior stays with them throughout their lives (never mind that their lives only last for a few days—the worm considers it a good run). Jin next did genetic experiments to find out how a particular brain cell called an interneuron, which processes olfactory information, turns a smell signal into a memory—and how it retrieves that memory later, when the adult worm is reacquainted with the smell of bad food. One by one, she silenced interneurons in the worm to identify those responsible for memory formation, storage, or retrieval. However, in doing these experiments she discovered that the different stages of the learning process didn’t actually confine themselves to one group of cells, or even to one area of the brain. Two of the interneurons she tested did generate an olfactory memory, as she had expected, but they did not seem to be required for retrieving the memory later. Instead, the retrieval task appeared to be handled by a separate group of interneurons residing elsewhere in the worm’s brain. C. elegans is not unique in using separate neural circuits for memory formation and retrieval. A similar phenomenon has been observed in humans—for instance, in the case of the legendary epilepsy patient “H.M.,” who in the 1950s had his medial temporal lobe surgically removed. After losing this part of the brain, the patient was able to retrieve old memories, but had difficulty forming new ones. 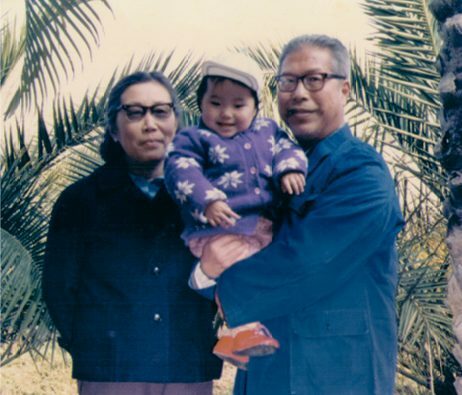 Jin grew up in the southeast of China, where her grandfather Desun Jin was a professor and the deputy director of the Fujian Institute of Subtropical Botany. After Jin came home from school, her grandfather often took her for a stroll in the botany garden, which has thousands of plant species on display. 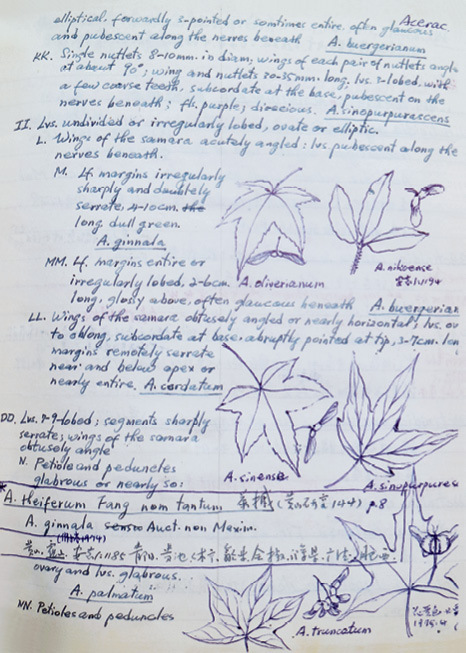 He would produce a pen and notebook, and teach her how to illustrate a plant and appreciate its individual anatomy—the woodiness of a stem, the shape and venation of a leaf, the delicate arrangement of a root system. He also planted in her young head a curiosity for other aspects of living things, too small to be seen. She says this idea also motivated her to study chemistry in college, at Peking University, and to subsequently embark on a daring journey: At 19, Jin decided to leave China and move, on her own, to the United States, to continue her chemistry studies at MIT. Two years later, as she was finishing up her undergraduate degree, she was preparing to go on to earn a higher degree while switching gears from chemistry to biology. A top student, she interviewed and received offers from a number of prestigious graduate programs around the country; deciding where to pursue her Ph.D. wasn’t easy. A page from Desun Jin’s sketchbook. But then she interviewed at Rockefeller, where researchers have been trespassing academic boundaries for generations. Among other scientists, she met with Roderick MacKinnon, a former physician and biochemist who in the 1990s, determined to solve a particular problem, taught himself x-ray crystallography, a notoriously finicky technology. (MacKinnon used this technique to determine the structure of the potassium channel, work for which he was later awarded a Nobel Prize in chemistry.) She spoke at length with Leslie B. Vosshall, a geneticist who has switched her lab’s focus from flies to mosquitoes, and developed a range of tools to study these disease-carrying insects (read more in “All the world’s genes, at our fingertips.”). And then, of course, there was that decisive interview with Bargmann, a former cancer biologist turned neuroscientist. “All these great scientists were so supportive and enthusiastic about teaching me biology,” Jin says. After these interviews, she no longer felt that switching fields would be a problem. “I’m moving to New York,” Jin wrote on her Facebook page. “See you in September!” Bargmann replied. 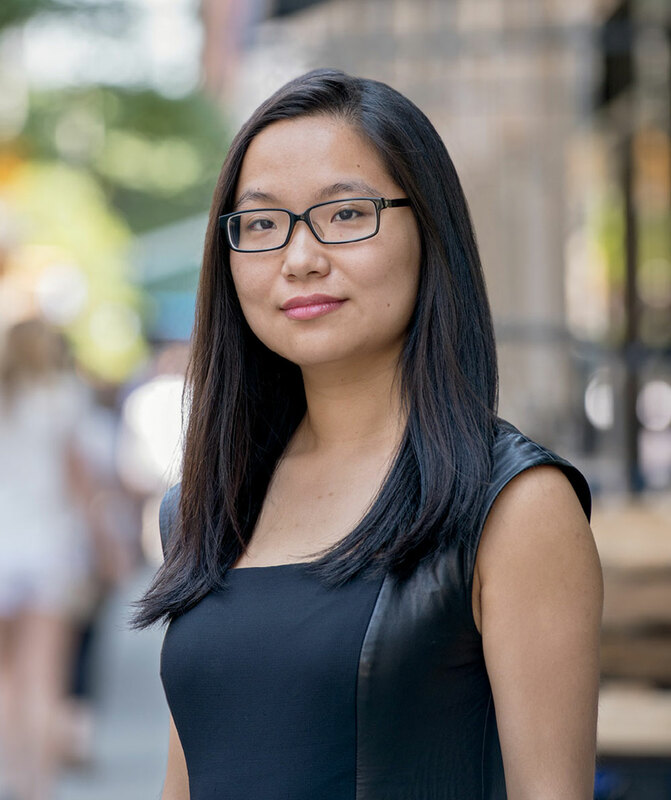 Last summer, after graduating from Rockefeller, Jin joined the Harvard University Society of Fellows, where she will once again be venturing into uncharted territory. This prestigious program offers junior fellows the chance to pursue research without formal requirements. “It basically means I could study whatever I want, be it biology or economics or medieval art,” Jin laughs. Yet generally speaking, she remains a neuroscientist at heart, and what she wants to do next is to tackle the vast complexity of the mammalian brain. “Why was our brain scaled up this much?” Jin says, referring to the evolution that led from the 302-neuron worm brain—through fish, amphibians, birds, mammals—to the 10-billion-neuron human brain. “We don’t quite know how many different cell types there are in the mammalian brain, or what they do. For example, can differences in cell-type composition tell us something about how one person’s brain differs from another’s?” She plans to seek answers to these questions working with Paola Arlotta, a developmental neuroscientist at Harvard, and through collaborations with bioengineer Feng Zhang’s lab at MIT. The project she intends to pursue is daunting, she says, and she is sometimes seized by doubt that it will work. Yet again, she recalls something she learned as a grad student, concerning her own mind’s penchant for critical thinking: it needs to take a break sometimes.